Myanmar Shalom welcomes you to the commercial capital city of Yangon. The city still maintains its colonial charm with wide tree lined avenues, lakes, and gracious turn of the century architecture. 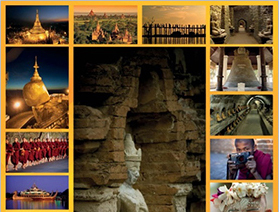 With a population of over 5 million, Yangon is lively and filled with excitement. The magnificent Shwedagon dominates the city skyline, while at street level Yangon is a paradise for hunting out a variety of exotic arts and crafts. At night time Chinatown comes alive with its pungent.